San Antonio Del Mar, Tijuana - Beautiful oceanfront home in San Antonio del Mar, with panoramic whitewater view and sunsets over the Coronado Islands. Dolphins just beyond the surf are almost a daily expectation here and the annual whale migration is literally at your doorstep in San Antonio. 18 holes of oceanview Championship golf are just 5 minutes away in Real del Mar, with ridiculously low green fees. Very bright and airy open floor plan with one of the bedrooms, complete with bath on the main level, allowing for true single level living. The second bedroom, or master suite is below with its own spacious and private covered oceanfront patio, and an optional private entrance from street level. This 2 bedroom, 2 bath home shows all the signs of diligent maintenance, and is offered furnished and fully turn key. 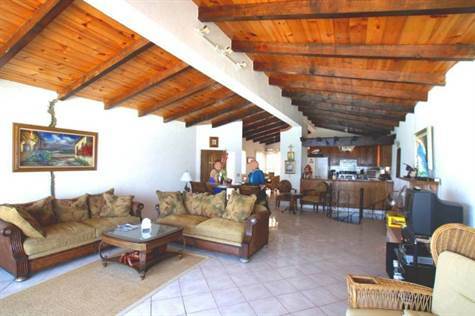 Equally suitable as a vacation getaway with good rental potential or as a primary residence on the beach. Located in the gated community of San Antonio del Mar means being 20 minutes close to the border and just 10 minutes north of Rosarito Beach with its shopping center, movie thaeters, plentiful restaurants and all emergency services close at hand. Low HOA fees of just $60/month help to pay for the guard service and trash removal as well as maintenance of the community tennis court, park with playground, and oceanfront swimming pool. Realistically priced and seller may consider carrying some short term paper as well.